If you are planning your next golf getaway and haven't considered Chicago yet, then it's high time you do. 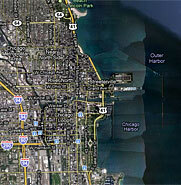 Chicagoans love their golf, and visitors will find an array of delightful Chicago golf courses to choose from. You don't even have to leave the city limits when looking to golf in Chicago, though with suburban courses like the four at Cog Hill looming on the horizon, you might want to consider it. The Cog Hill Golf and Country Club hosts a high-profile PGA golf tournament every year on its Dubsdread Course, which easily figures among the area's top golfing challenges. There are plenty of possibilities for great Chicago golf, thanks to the numerous area courses, so don't forget to bring the clubs on your next visit. The Cog Hill Golf and Country Club, which can be found in the suburb of Lemont, is one of the first places you will want to check out when it comes to your Chicago golf getaway. If you can't afford the rates on the Dubsdread Course, which is the one that the pros play when they are in town, then there are three other fantastic 18-hole courses here that don't cost quite as much. Hitting the driving range at Cog Hill before you hit the links is a good idea, as all of the courses here are challenging. Other great suburban Chicago golf courses you'll do well to play include the 18-hole beauty at the Kemper Lakes Golf Club in Hawthorn Woods, the challenging 18-hole course at the Pine Meadow Golf Club in Mundelein, and the three different 9-hole courses at the Cantigny Golf Course in Wheaton, just to name a few. If you are without your own vehicle during your Chicago vacation, a rental car is recommended to get to some of these courses. If you are staying in the Loop, or somewhere else within the Chicago city limits, you don't have to venture to the suburbs to enjoy a satisfying day of golf if you don't want to. Consider playing the 9-hole Sydney Marovitz Course, which is usually referred to simply as Waveland by locals. This course, which can be found at 3600 N. Lake Shore Drive, rests right on the shores of Lake Michigan, and you're bound to enjoy the views. Often packed with golfers on the weekends, the popular course is often much less crowded on weekdays, so you might consider a midweek round if it fits your itinerary. On the South Side of Chicago, you will find one of the other top Chicago golf courses. The 18-hole Jackson Park Golf Course, which is located at 63rd Street and Stoney Island Avenue, is often less crowded than the Sydney Marovitz Course. Both of these courses, along with a handful of others, are city-run, and the rates are relatively low, which only adds to their appeal. These Chicago golf courses are just some of the courses that you will want to keep in mind when looking to add golf to your list of things to do in Chicago. The Harborside International Golf Center, which can be found farther south than the Jackson Park golf course, offers two more great courses that deserve consideration as well, for example, so it pays to explore the options. Before you head out for a round of golf in Chicago, you can always work on your game at the Diversey Driving Range, which is located in the lovely neighborhood of Lincoln Park. Good rates and great views of the beautiful apartment buildings close by help make this driving range a hit with locals and visitors. While most people who are looking to golf in Chicago have a true round of golf in mind, others might prefer a miniature golfing experience. In that case, The Green at Grant Park is the place to go. Head just east of Millennium Park to find this 18-hole miniature golf course, which offers great putting challenges, not to mention an attractive park setting. Should you stop at the restaurant afterward for drinks or a satisfying meal, you're sure to find relaxation in the equally inviting garden setting. Whether you are looking for fun things for kids to do in Chicago or you just want to work on your putting, The Green at Grant Park will likely suit you. Golf in Chicago is alive and well, and on any of the courses, you're bound to come away from the experience satisfied. When you're not enjoying some Chicago golf on your next Windy City trip, there will be plenty to do on the side, so you can easily fill the itinerary in no time. Shopping, dining, and taking in a show are just some of the joys to be had on a Chicago visit, so you'll have no trouble keeping busy when you're not teeing it up.